Happy Thursday, everyone!! Here is more of a casual outfit, but the wedges really dress it up a little more. Flats would pair so well with this too! You look adorable in this look. I just love peach and coral colors- they look good on absolutely everyone! You are the prettiest pregnant woman?….I never looked that cute with my twin daughters!! They were born in August…hot & humid. Amazing..love sorbet tones ..and this one is so cool!!! Love those sandals, and those jeans are the perfect amount of distressed! Love the color of that top! This is such a great casual look. Love this look – so pulled together but nice and casual! Adorable outfit! I love the color and breeziness of the top and those wedges are great! I LOVE me some sherbet orange and you look amazing as usual! How did you get your hair so long? Any tips/recommendations on that? Thank you girl! PS! Not that I’ve been pregnant yet but how are you managing to walk in heels so far into your pregnancy? Beyond praying I have the same luck (no swollen feet) when I start growing a family. I adore you Rach! Have a great day! I love the color & detailing of that top Rach! It’s so pretty for summer!! You look amazing and I love how you pull off so many non-maternity outfits beautifully! What’s your trick for wearing non-pregnancy jeans? Is there a specific belly band you love? Thanks in advance!! Hi Laura! As far as non-maternity outfits, Its nice that it is summer because I can wear dresses almost everyday for the summer heat and jeans are usually too difficult to wear! I usually go up a few sizes in a dress to get one that fits! 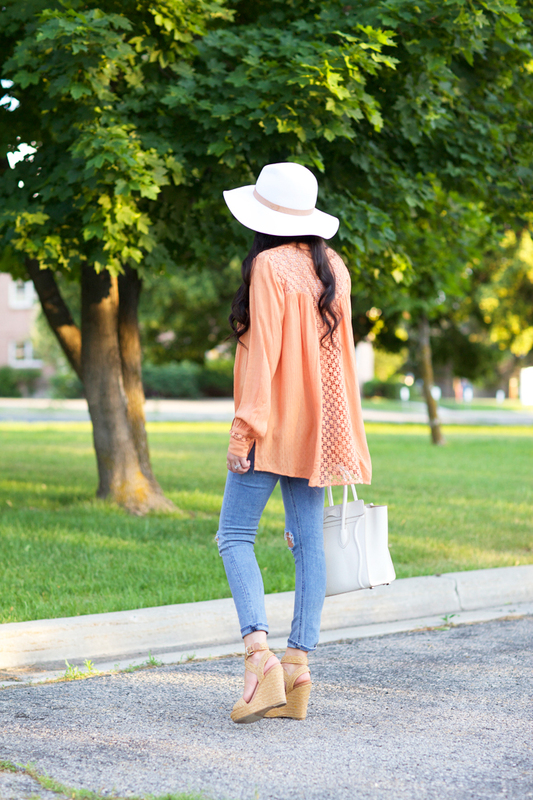 I love this gorgeous peach color for summer and this entire look is just so easy to wear ! I love your style so much, seriously goals over here haha ! Your style is so lovely but also attainable <3 I'm so excited for the new baby to come as well so we can see it !! Love this look on you and the soft orange. Well done. Love this top and the detailed panel on the back! Free People tops are always so comfortable. You rock that hats! Can you do a post on some of your favorite dupes for designer items such as bags and shoes? Love the casual looks on you Rach! Have a lovely holiday weekend. Oh I adore this outfit!! That orangey toned top is fab!! And this post name is just so super cute!! Hope all is well with you… by way of IG, it looks like you had a fun getaway at Lake Powell. My boyfriend’s sister and her little family live out in Utah, and I was talking about going out to visit her and driving to that lake is on my bucket list!! It looks so lovely and tranquil! Loving the flowy feel of the top. I’m always looking for more casual everyday inspiration. You look beautiful as always! Hi Rina!! I know its perfect for my growing bump, but so comfy and flowy too! love the little crochet details! Always styled top notch! You’re such a gorgeous mama! I adore your shoes and your blouse, so beautiful look ! those wedges are darling! very cute look! You are too adorable! Love this look, especially that top! The color looks amazing on you! Ohh you are looking incredible! Love that colour on you! The back of that top is so cute! Love this top, so cute! The back of that top is really pretty! Love the color on you! So gorgeous! Perfect pregnancy shirt too! love it. hi Rachel I wonder if you could tell us a little more about your pregnancy. You had a c-section with little Isla. Or you planning an c-section again? How has this pregnancy affect you (your body) as it is not long time after first c-section you got pregnant again. I’m 3 months pregnant, live in Sweden. I’m not sure if I want to do a c-section or natural birth. I’m scared but I’ve heard alot of positive about women with c-section. Your shirt is such a lovely colour! You look radiant! Love this simple and chic outfit, the sandals really do dress it up. Cheers to you for pulling them off, I could only wear high heels for a couple of hours when I was pregnant.